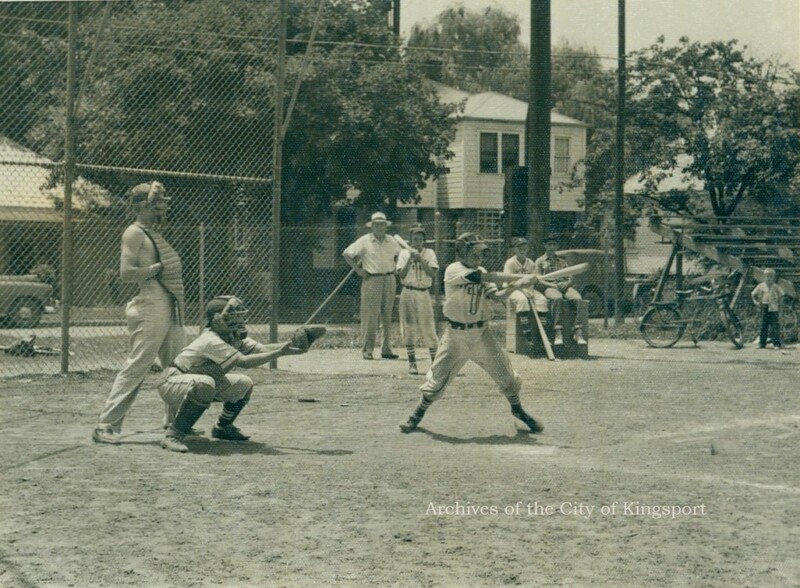 Kingsport has had a long love affair with America’s favorite pass time. The keepsakes from this relationship are not movie stubs, pressed carnations, and love letters. Instead, the archives is brimming with score sheets, photographs, baseball cards, and so much more. All of these memories have inspired the latest archives exhibit at the Kingsport Public Library! This blog, by the way, is dedicated to reader Kathleen Fueston who has been patiently waiting for my next post and reads each one faithfully. Hope you like baseball, Kathy! When librarian Karen Cassell suggested baseball for the subject of our next exhibit, I wondered if we had enough materials. One simple search on the archives online image database proved my worries were unnecessary. The problem was I only had two cases in which to display our collections!! The featured items span from the 1930s to the 199os. Let me share with you some of the amazing images and some of the things I’ve learned. 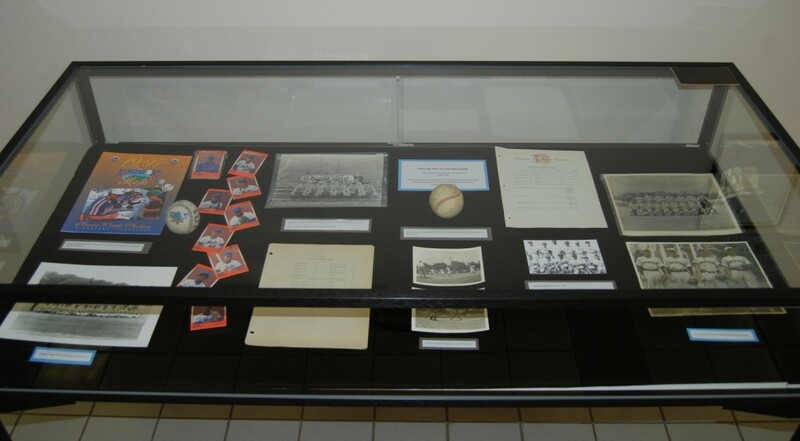 Items in the left case include memorabilia from Kingsport’s minor league baseball teams, statistics from Dobyns-Bennett’s 1950s seasons, and the first ball thrown in the new J. Fred Johnson Stadium. A c.1955-56 game at Robinson Middle School . Notice the shirtless umpire, the vintage bike in the corner, and other bits of Americana. The archives has so many team photos that I couldn’t include a tenth of them. Here’s a favorite of Kingsport High from 1935. 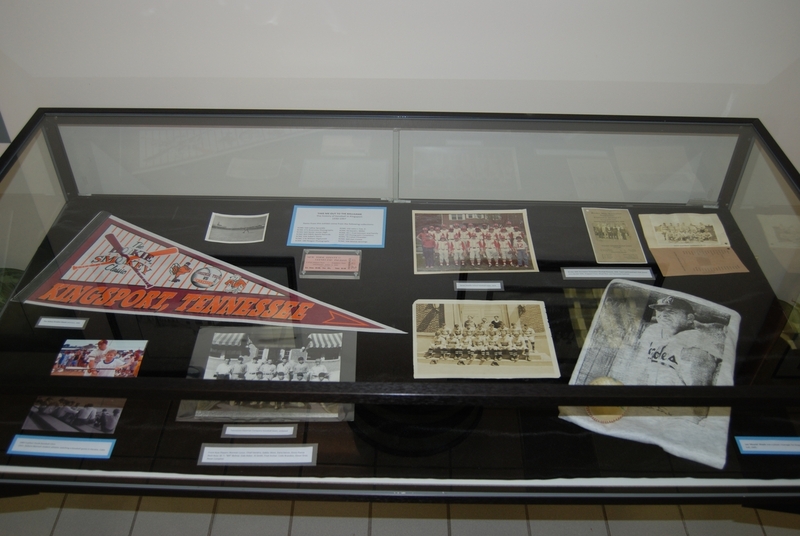 The right case showcases a Hokie Smokey Classic pennant, a 1972 team photo from Sevier Middle School, and a 1930 community league banquet program. 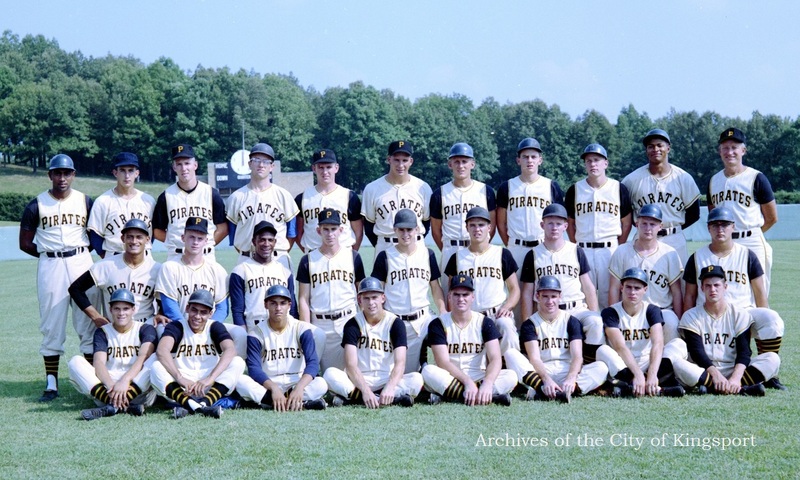 Before Kingsport had a minor league team called The Mets, it had The Royals, The Pirates, and The Cherokees. 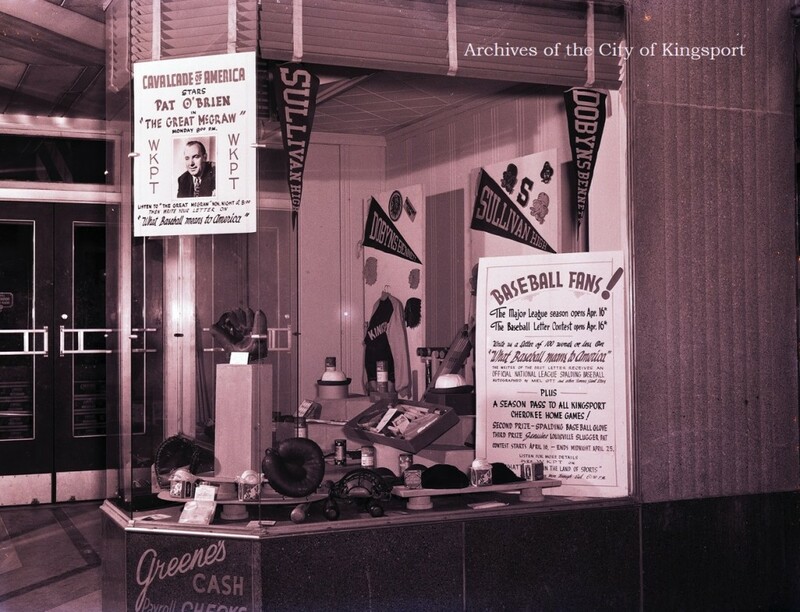 I love the W. B. Greene Store baseball promotion contest seen in this 1946 shop window. The winner received an official National League Spalding baseball autographed by Mel Ott (right fielder for the NY Giants) and a season pass to all Kingsport Cherokee home games. The exhibit “Take Me Out to the Ballgame” will be on the main floor of the Kingsport Public Library until mid-September 2014. Remember that there is so much more to see in the Archives of the City of Kingsport, so please stop by sometime. Bring your own Cracker Jack. Feature image: DBHS baseball players traveled to Havana, Cuba with Coach Sprankle in 1941. Author’s Note: Archival photograph information is derived from the case files and from writing on the photographs themselves. Suggested corrections should go directly to the archives and not to this blog. Unkind comments will not be published. This entry was posted in Kingsport and tagged baseball, ephemera, exhibit, Kingsport. Bookmark the permalink. 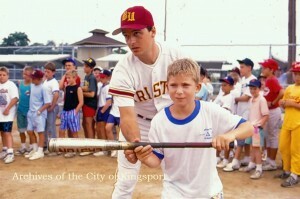 2 Responses to Kingsport: Play Ball! Ahh! You just made my day. Thanks, Kari, for the dedication. Actually, one of my fondest baseball memories is with you and your dad at an Angels game! What a fun time. I also remember being in Dodger Stadium with my family for the World Series in 1981 as well as Mormon Night at Anaheim Stadium. Just two weeks ago while in California for a quick visit I drove by Anaheim Stadium with Karen, Linda and Tammy on a game night. On the way home, I noticed the “halo” at the top of the large “A” sign at the stadium was lit up. I was told that the halo is always lit when the Angels win a home game! Go Team!! I have no game to go to tonight but for some reason I’m craving a good hot dog and some Cracker Jack! I love the new display. 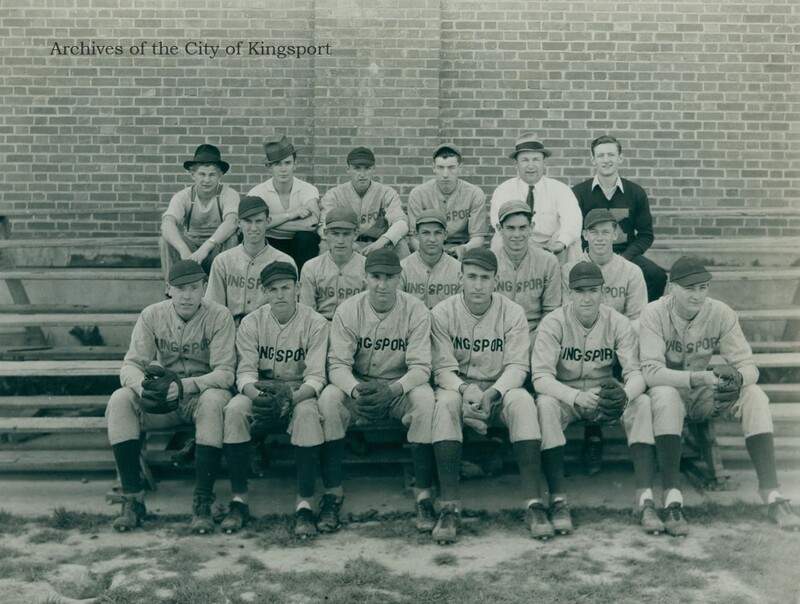 Kingsport has a rich baseball history.